Nature lovers in East Yorkshire have been treated to the sight of a pod of dolphins off the coast. It’s certainly not the usual granite property we are accustomed to in Aberdeen, but that was exactly what attracted the Mains to 8A South Headlands Crescent. 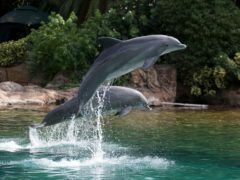 Dolphins can learn tricks such as walking on water from each other in the wild, a 30-year study has revealed. 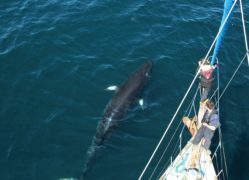 A popular initiative for spotting marine life in Aberdeen had a 100% success rate for sightings this summer. An adorable seal has made friends with a group of north-east paddleboarders. Stunning aerial footage has been captured by photographer Chris Gulland of a pod of dolphins feeding between Port Erin and the Calf of Man on the south coast of the Isle of Man. New laser technology is to be used to for “pioneering research” into whales and dolphins living off of Scotland’s west coast. A sealife charity has stopped selling plastic bottles in an attempt to help the environment. A pod of wild dolphins joined forces with an RNLI lifeboat crew while they were at sea on exercise. The pod followed the Scottish crew and played gleefully, jumping above the waves and racing alongside the vessel. Mysterious strangers have been spray painting blue dolphins around Aberdeen. Many sick and seriously-ill children from across the UK have left their families behind and conquered their fears on a once-in-a-lifetime sunshine holiday in the US.